The water is coming up every day, so the fish habitat is changing constantly while the Alameda County Water District is pumping in water. The lake came up over two feet in the last two weeks! As a reminder, we do not sell state fishing licenses at Quarry Lakes, so please be sure to pick up your new state license before you come fishing in 2017. Thank you! A few catfish are still being caught. Over 2,000 pounds of trout from Mt. Lassen have been stocked in the lake over the last 2 weeks of December. Bass bite has been fairly slow. Not too many anglers have reported catches. 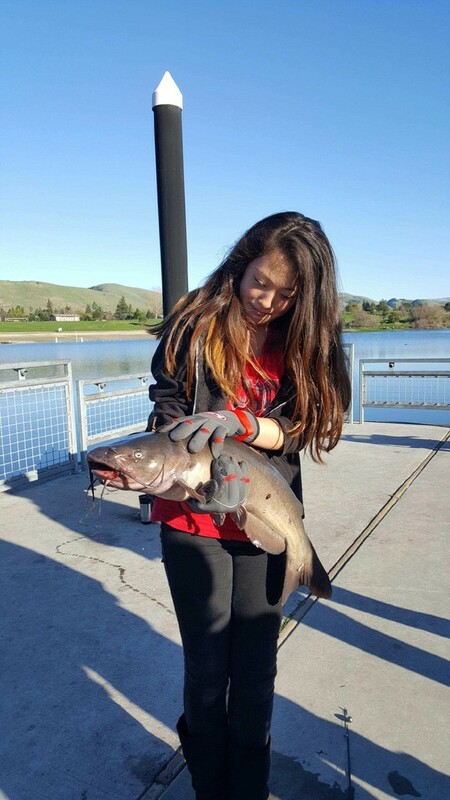 Leilani Kim of Fremont, caught a 12-pound, 30-inch catfish using a seasoned chicken liver. She was fishing with her dad and sisters from the disabled-accessible fishing pier on December 17, 2016. 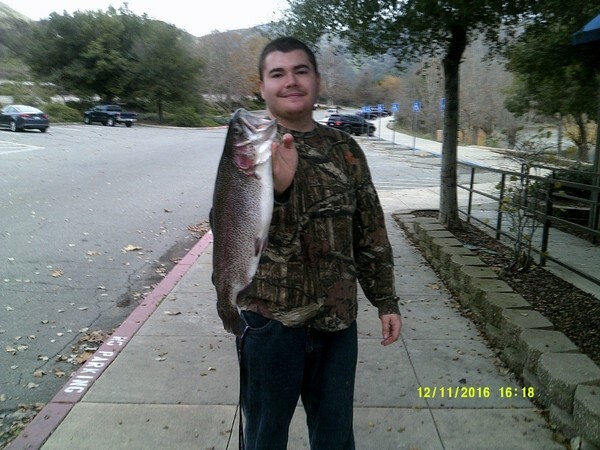 On December 25, 2016, Nick Phothisane of Hayward was reported to have caught five trout for a total weight limit of 17 pounds from the Peninsula Point! On December 24, 2016, Peter Simpson of Fremont caught a five-pound, two-ounce trout using rainbow power bait! Peter was fishing in the Kiosk Cove. On December 21, 2016, Jack Antrim of Hayward caught and released four trout, each weighing about three pounds! Jack was using a needlefish and was fishing from his boat in the front part of Horseshoe Lake. On December 12, 2016, Marc Suzuki of San Jose caught a 12-pound catfish using green pumpkin power bait! Marc was fishing along Fishermen’s Row. On December 11, 2016, Mark of San Jose said his friend Matteo from Italy (! ), who was fishing for the first time in the United States, caught a 5 1/2-pound trout! They also caught a couple of three-pound trout using rainbow PowerBait and lime power balls. They were fishing from the Peninsula Point.